Kurdistan has not yet declared independence from Iraq, but it may happen as a result of a September 25 independence referendum that passed overwhelmingly, according to Kurdistan president Masoud Barzani. However, Barzani says that at this time rather than declare independence, he wants simply to negotiate with the Baghdad. Nonetheless, if there is any violence in Kurdistan, it will be over Kirkuk. Starting in 2014, Kirkuk has been under frequent attack by the so-called Islamic State (IS or ISIS or ISIL or Daesh), and ISIS has always been repelled by the Kurdish Peshmerga militia forces. Now that ISIS has been expelled from Mosul and the danger to Kirkuk from ISIS has passed, Kurdistan's leader Masoud Barzani is saying that Kirkuk belongs to a Kurdistan. Iraq's parliament has responded by voting to give a mandate to Iraq's prime minister Haider al-Abadi to deploy troops in Kirkuk, and take control of the city from the Kurds. The deployment would be in response to the independence referendum, and the fear that Barzani would declare independence. "We cannot agree with the decision of the Iraqi authorities to send troops to Kirkuk. If the Iraqi Army enters Kirkuk it will face our stiff resistance. The defense of Kirkuk has taken the lives of hundreds of Peshmerga fighters and city residents. Now, the Kurdish forces and civilians in Kirkuk are ready to continue defending the city. There isn’t such a force in the world that could take Kirkuk away from the Kurds." Kurdistan produces over 600,000 barrels per day of crude oil, mostly from oil fields around Kirkuk, and this oil production forms the greatest part of Kurdistan's income. Kurdistan sells the oil through a pipeline that passes through Turkey. Turkey's president Recep Tayyip Erdogan has threatened to close the pipeline, but hasn't done so yet. The fact that Kirkuk is oil-rich is just one of the reasons why it's become a flash point. The other reason is that, in addition to Kurds, the city is heavily populated with Arabs and Turkmens, and these populations do not wish to live under Kurdish control. During the last few days, I've reported on three different independence movements -- in Catalonia from Spain, in the Anglophone Southern Cameroons from Francophone Cameroon, and in Kurdistan from Iraq. The Kurdistan case is substantially different from the other two. In Catalonia, Spain's national police resorted to physical violence to keep people from voting. Video showed people being kicked and thrown and women pulled by their hair away from the polling stations. Reports from other parts of Spain suggest that many people outside of Catalonia say that the violence on Catalans was deserved. In Anglophone Southern Cameroons, Cameroon's Francophone national police shot and killed at least seven people over the weekend and wounded dozens of others in an attempt to stop peaceful demonstrations. An official was quoted as saying, "What can the Anglophones do? If they don’t want to go to school, so much the worse for them." In both of these cases, we clearly see a resurgence of vitriolic xenophobic attitudes that gave rise to previous generational crisis wars -- the Spanish Civil War in the late 1930s, and the bloody civil war in the Cameroon colonies in the late 1950s, respectively. However, we're not seeing anything remotely like that in the Kurdistan separatist movement in Iraq. Nobody tried to prevent the independence referendum that took place in Kurdistan on September 25. Kurdistan president Masoud Barzani says that the referendum passed overwhelmingly, but Barzani says that rather than declare independence, he wants simply to negotiate with the Baghdad. Baghdad and Iran are sending troops to the Kurdistan border, but there's no sign that they plan to cross the border. These are the kinds of things that one looks for when doing a Generational Dynamics analysis of a country or event. There is no apparent xenophobic vitriol between the Iraqi Kurds and the Iraqi Shias, as there was between the two pairs of groups in Spain and Cameroon, respectively. And, as usual, what's important in a generational analysis is not the behaviors and attitudes of the politicians, but the attitudes and behaviors of entire populations or generations. 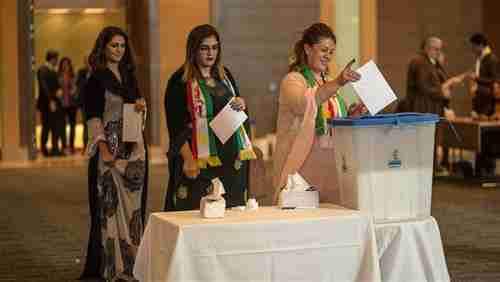 So the most likely outcome of the independence referendum in Kurdistan, based on the information so far, is that there will be political posturing and threats, but no actual violence or military confrontation. Of course, this could change at any time, especially if Shia militias controlled by Iran invade Kirkuk to displace the Peshmerga. But without something like that, violence is not expected.